New Khukuri with custom engraving of Tiger skin pattern for good looks. A Winner from both sides. This new Khukuri has custom engraving done on its Indian rosewood scabbard and on the handle as well. Tiger skin pattern and a tiger's head is customarily engraved giving this Khukuri a very attractive look. This pattern has also given the handle a good grip making the grip very firm and very less chances of loosing the blade when in use. 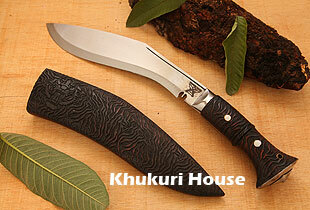 This new Khukuri blade can be a winner and both ways. One can find it attractive and have it for show and some can make it a good functional one as it has the full tang and the grip thing.